A quicker version of classic eggplant Parmigiana but still including the essential ingredients: Golden eggplant, bread crumbs and rich tomato sauce topped with mozzarella and Parmesan then baked to bubbly perfection. Purists, please avert your eyes! Many years ago we were living in Paris and the summer of 1993 brought us a beautiful baby girl and, two weeks after her arrival, my mother to help me when dear husband went back to work. (Yes, France has paid paternity leave!) She brought along her wonderful friend, Lillian, and together, they spoiled us rotten. Lillian’s specialties were anything Italian and, from her, I learned how to make eggplant Parmigiana, which we adored. I must confess that if Lillian were ever to read this post, she would not recognize her recipe because I have developed many shortcuts over the years of which I know she would not approve but, honestly, when I did it her way, I didn’t make eggplant Parmigiana often enough. And my way is healthier. Please forgive me, Lillian, but it’s really not just laziness that made me change your recipe! And I hope you know that your kindness and generosity touched our hearts even more than your wonderful meals increased our girth. We have never forgotten you. Dice the onion and garlic and sauté them in a couple of good glugs of olive oil. Turn the fire to medium and put the lid on to let them sweat and get soft. This could take as many as 20 minutes. Stir occasionally, letting the condensation on the lid drip back into the pan. When the onions and garlic are soft and translucent, add the canned tomatoes and sauce, along with about another can full of water and the two tablespoons of oregano and the tablespoon of sugar. Lower the fire to simmer and cook the sauce down, covered, until it is thick and the whole tomatoes start to break apart. You can speed this process along by mashing them with a potato masher, right in the pot. Add salt and pepper to taste. Continue to simmer until you are ready to assemble your eggplant Parmigiana. Meanwhile, slice your eggplant and heat your griddle. Lay the slices on the hot griddle and drizzle with a little extra virgin olive oil. Flip them when browned on one side and remove to a plate when both sides are brown. Don’t forget to give your tomato sauce the occasional stir while you are browning the eggplant. Your sauce is ready, your eggplant slices are ready and now it’s time to assemble the dish. Next, sprinkle the sauce with breadcrumbs. Now add a layer of eggplant slices. And sprinkle again with breadcrumbs. Now add another layer of tomato sauce. Then add another layer of eggplant slices. And another coating of breadcrumbs. You get the picture. The layers go tomato/eggplant/Parmesan, but you put a thin sprinkle of breadcrumbs below and on top of the eggplant each time to mimic the breadcrumbs you would find on each side, if you had dipped the slices and fried them first. Your final layer will be tomato sauce topped with Parmesan, mozzarella and about 25g of breadcrumbs. I mixed mine together by hand and sprinkled them on. I find the breadcrumbs help the cheese not stick together as much, which makes sprinkling it much easier. Bake at 350°F or 180°C for about 45-50 minutes or until golden and bubbling. 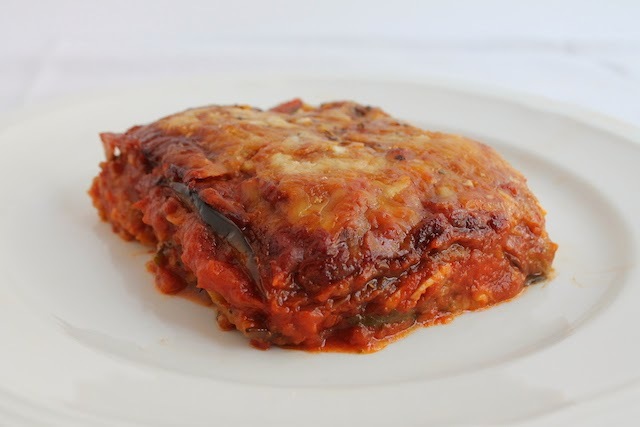 We love eggplant Parmigiana and will be forever grateful to Lillian for introducing us to this delightful dish.